Have you seen this stuff before? 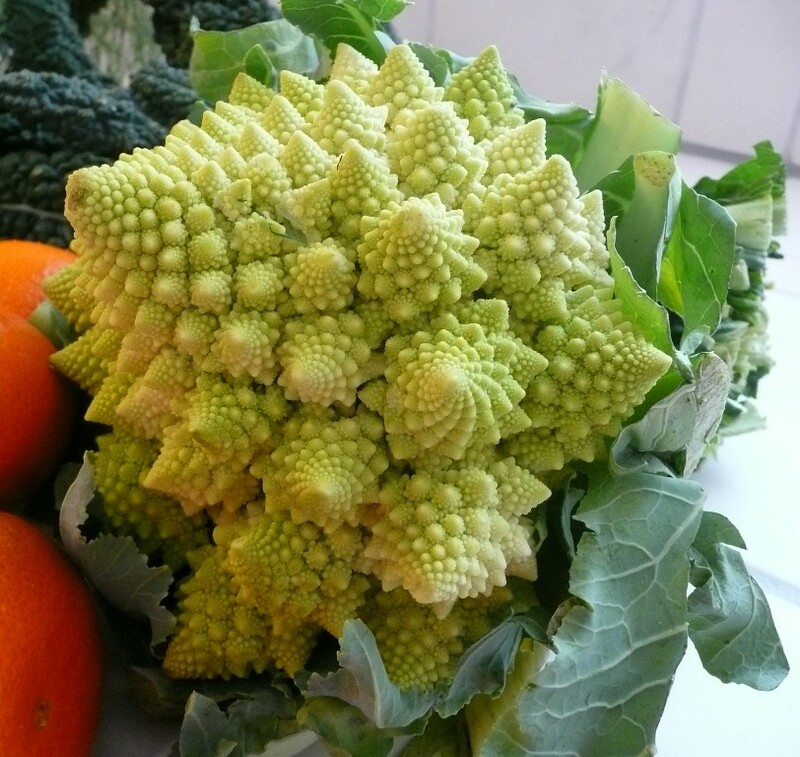 Doesn’t this look as if it is a vegetable from another planet? The first time I saw it I was at a farmers market and I asked the vendor if I could take pictures. This vegetable made me laugh. I thought it was one of the funniest vegetables I have ever seen. I thought she had called it an Italian Cauliflower. She had me believing it tasted like cauliflower. I am not really a fan of cauliflower so I wasn’t interested in buying it and trying it. But lo-and-behold I received some in my organic produce box that I have delivered. Yay! AGAIN, I received something that I would not have bought. Often times I don’t think about somethings so I don’t buy them, but this particular vegetable I was once faced with buying but declined because I didn’t know what it was! So here I had some delivered and so I “HAD” to try it. Well, I actually received two. One head on one delivery and another head the next. Yeah, that is kind of long for vegetables to sit in the fridge, but . . . sometimes even though I get it delivered I am still not all that enthusiastic about trying it. Plus, I am still trying to get my new schedule down. I have just started teaching Nia classes two nights a week and so I need to have my cooking schedule down and when I don’t know how to cook something a night I am rushing off to teach is not a good night to experiment. So, I received a new bunch just this past delivery. Plus I still had the first bunch. So I decided to cook them both at once. I bet you know how I cooked them . . . . you got it. I chopped it up and put it on a pan with olive oil and garlic salt and I roasted it. I decided to cook it a little later than I normally would have started my roasted veggies – meaning the rest of dinner would be done really quick – so I really cranked up the heat. I started it off at 450. I cooked it for about 10 minutes. Then I turned it down to 400 and cooked it for about 10 minutes. Then I think I turned it off and cooked it for about 10 minutes. 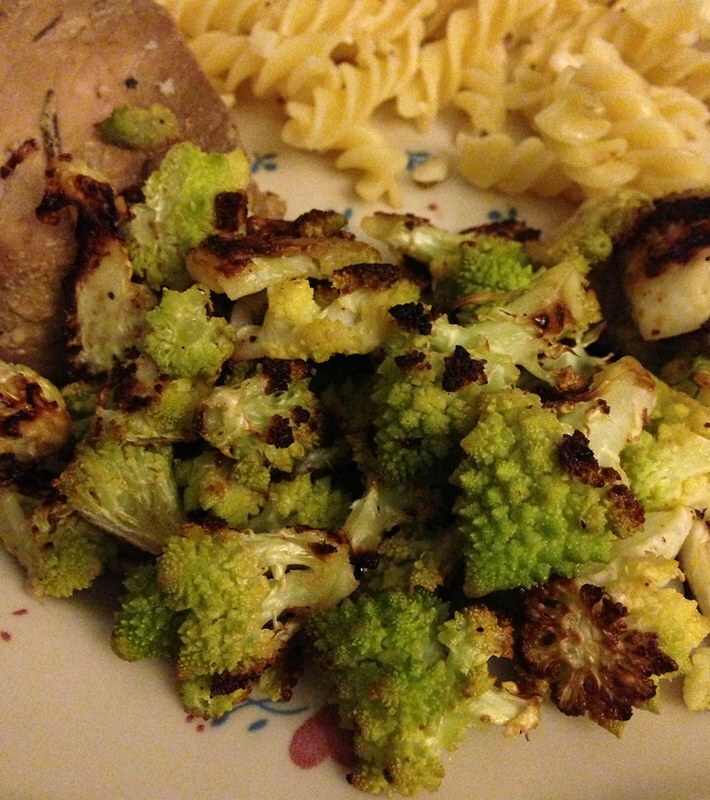 It seemed to cook faster than both broccoli and cauliflower. It browned very nice. I thought it would take a long time because it seems dense like cauliflower. Well, it seemed to cook up faster. Yay! Well, I was very surprised at the sweetness of it. It tasted really sweet. It was very funny having that cornucopia shaped veggie on my tongue. It is pokey. It has a mild flavor. A little sweet. Well, I have to say that I like it. I am unable to find nutritional information on it. Maybe as it gains popularity the nutritional information will start showing up on the internet? Have you seen it? Have you tried it? What do you think?